The Soviet legacy lives on in Moscow even though the city has been massively rebuilt since then. 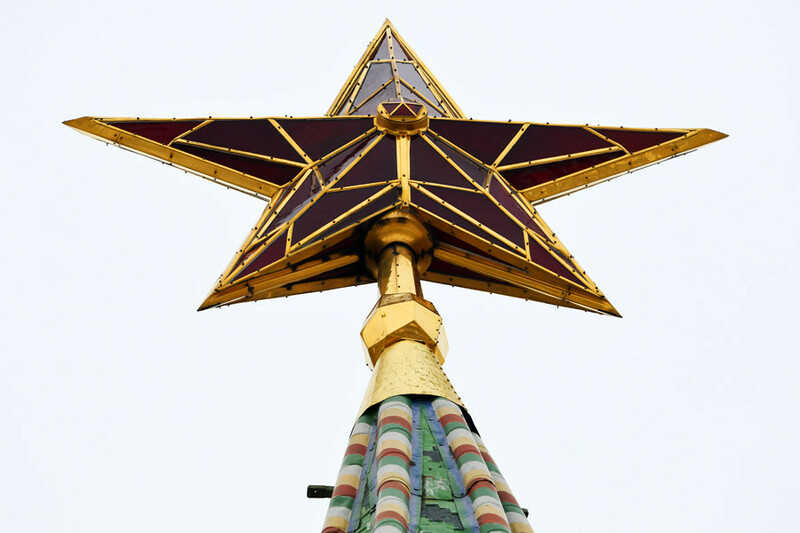 Here are some of the Soviet main symbols — stars — which you might encounter on a trip to Moscow. Though the Kremlin was built as an ancient residence for princes and tsars, many people associate its walls with the red Soviet power which presided here for more than 70 years. Thanks to the stars. 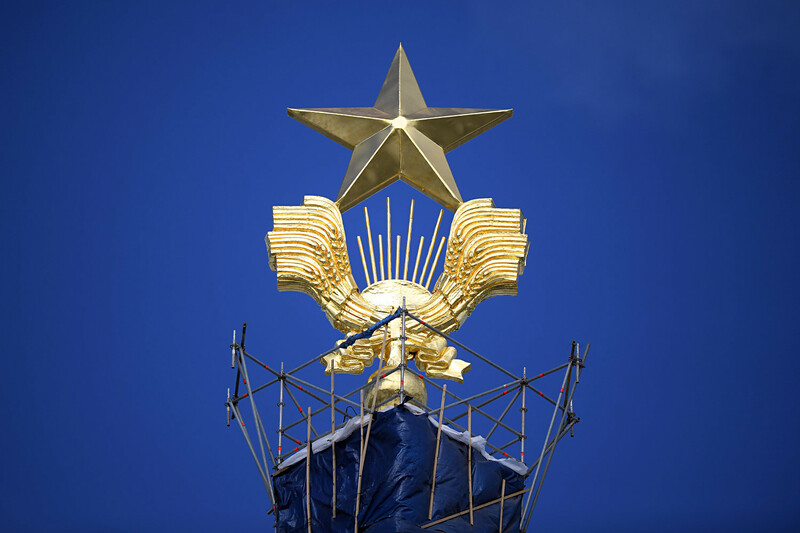 Before the Revolution of 1917, the four towers of the Moscow Kremlin were decorated with two-headed eagles, the symbol of the Russian Empire, but in 1935 the birds were replaced with five-pointed stars. You can’t tell it from a distance but the biggest stars – on the Spasskaya and Nikolskaya Towers – are 3.75 meters in length. 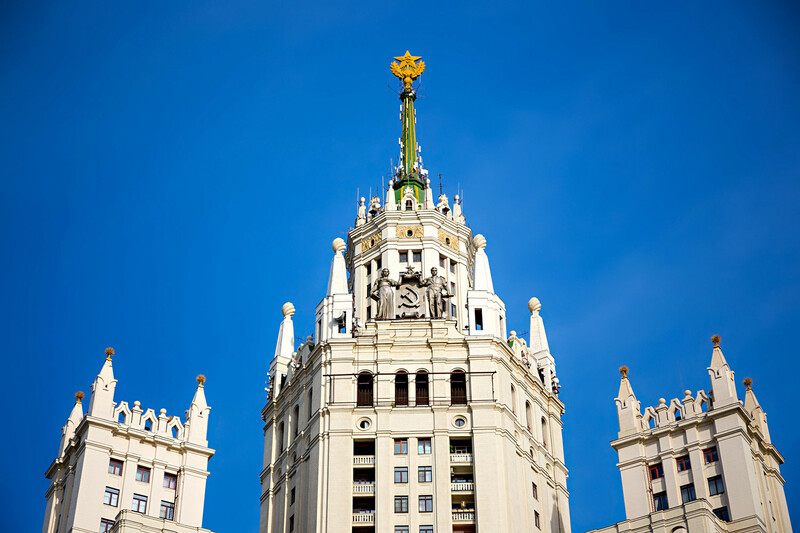 The spire and the star on Russia’s main university reach a height of about 60 meters in total. 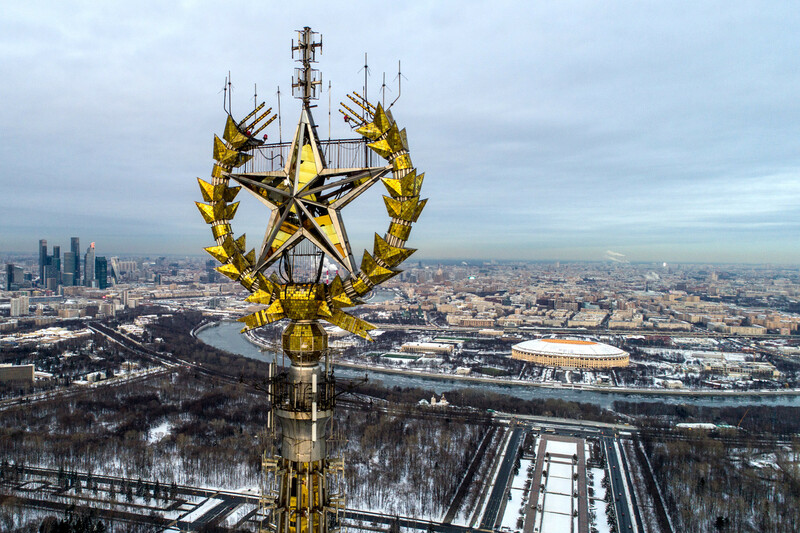 There is a rumor that this star is currently used by the Russian secret service as a viewpoint (so there might be a high definition webcam placed in it) – Moscow’s version of the Eye of Sauron. Here’s another one of Stalin’s Seven Sisters topped by a 30-meter spire and star. 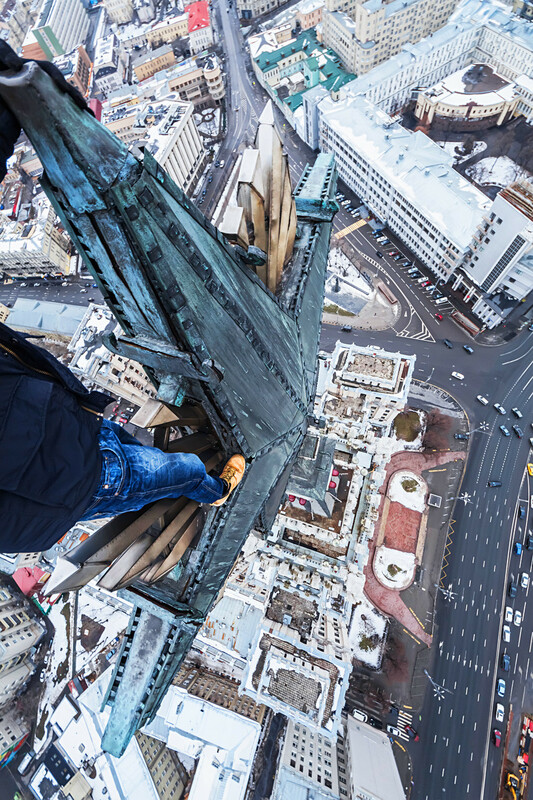 All these skyscrapers' stars are popular among rooftoppers, who aren’t afraid of either big heights or being arrested. 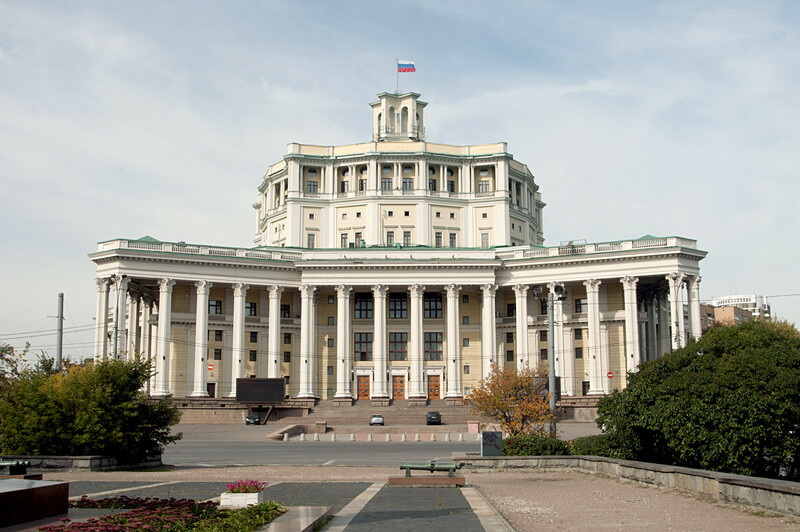 This building was constructed after Stalin's death and remains the highest hotel in Europe (206 meters). There is also a restaurant with a great view inside. Its first name was Ukraina (Ukraine) in honor of the then Soviet leader Nikita Khrushchev's motherland. In 2010 it was reconstructed and opened under the new name of Radisson Royal. There is a pier for Radisson boats right next to it, a great way to see Moscow from the water whatever the weather. Another hotel among Stalin's Seven Sisters, the former Leningradskaya Hotel, is situated next to Leningradsky railway station and bears the same name. This building is relatively low, reaching only 136 meters. 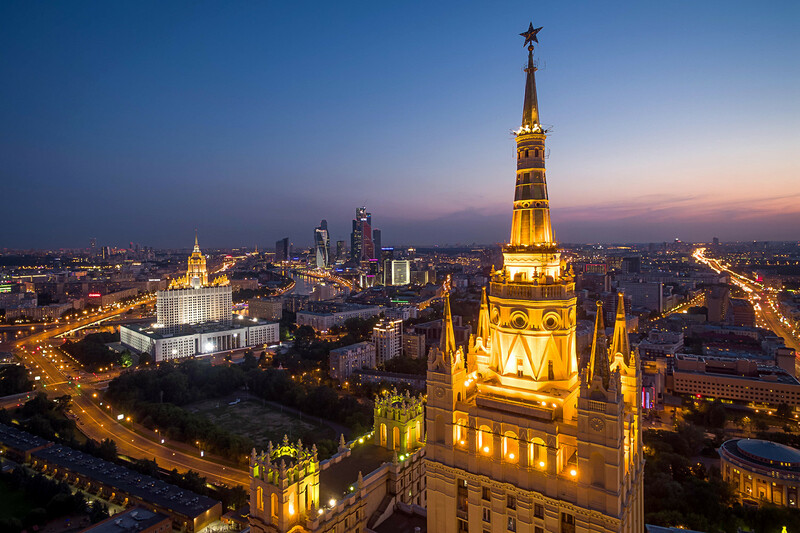 All of Stalin’s Sisters have stars on the top except for one – the building of the Ministry of Foreign Affairs, where the spire turned out to be too fragile to hold a star. 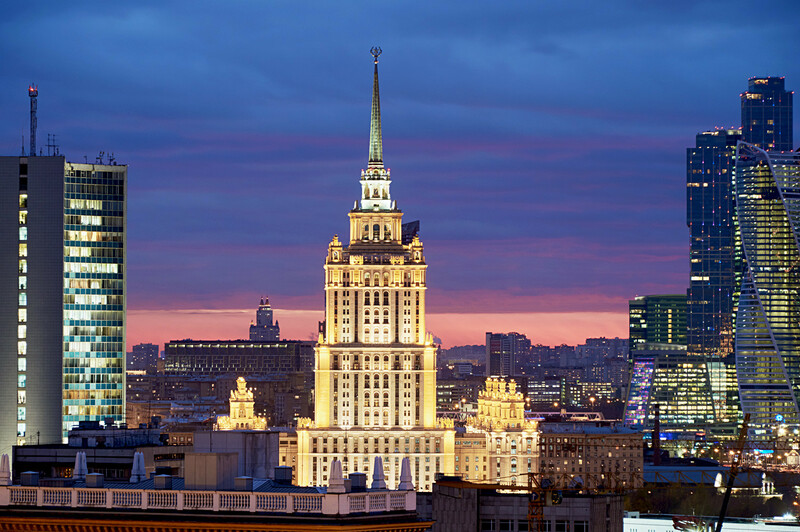 This is another skyscraper with a great view of the Moskva River and the Kremlin. The unusual star atop this building is now painted yellow, while others are gold and bronze. During the hot phase of the armed conflict in eastern Ukraine in August 2014, a group of rooftoppers (Russians and Ukrainians) painted the star blue and yellow, the colors of the Ukrainian national flag. The action was denounced as vandalism and one member of the group was sentenced to some sort of house arrest for nearly 3 years. This 136-meter building is situated at the highest point of the Garden Ring in Moscow and visually seems to be higher than it really is. Interestingly, you can get from the main building to the left and right wings only via basement corridors. Gazing at this building erected in the 1930s, you’ll never guess why we’ve included it in the list. 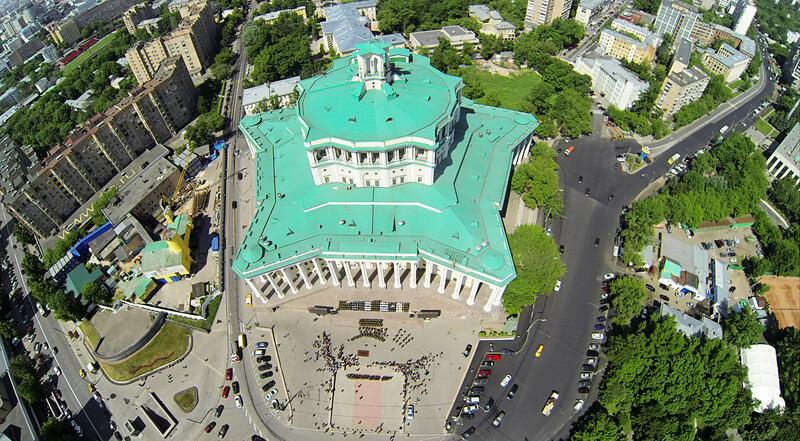 But it if you look from above, you'll see that this former Red Army theater was built in the form of a star, the main symbol of the Red Army. 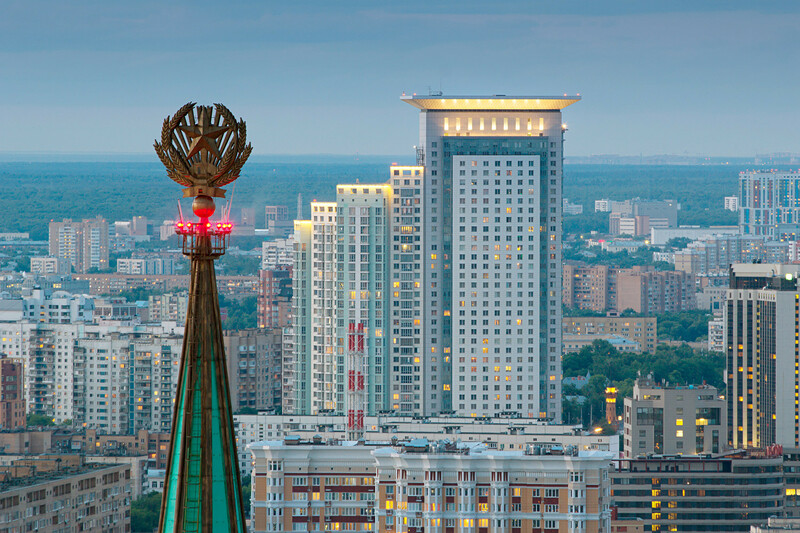 Each of the star's rays indicates the direction of Moscow's major transport hubs, while the fifth looks to the city center. There is a legend that Nazi pilots used it as a handy map while bombing the Soviet capital during WWII. The whole VDNKh park is a hymn to the Soviet era. 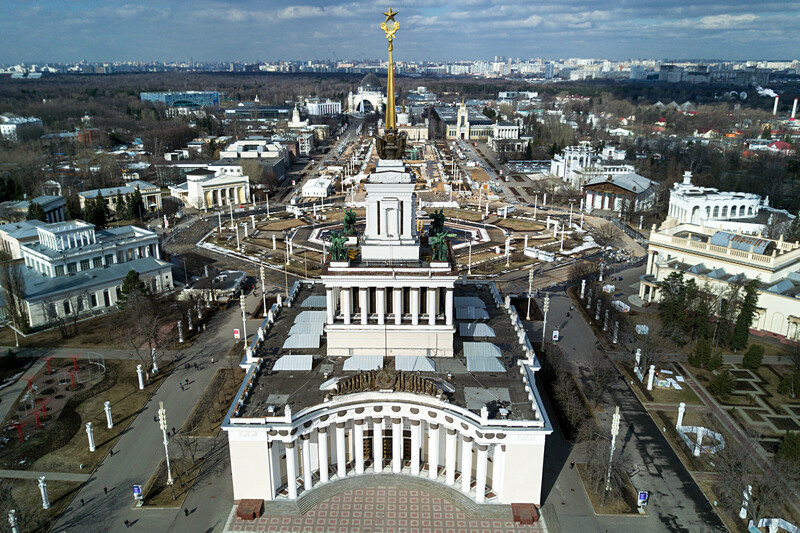 The main pavilion of VDNKh, which is just five minutes’ walk from the main entrance, is a true example of the so-called Russian Empire architectural style. 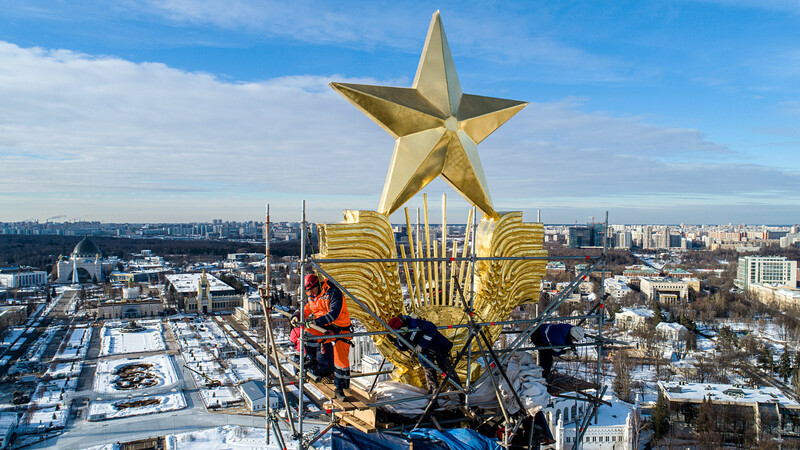 The star sitting on top of it at a height of 90 meters has just been opened after renovation. 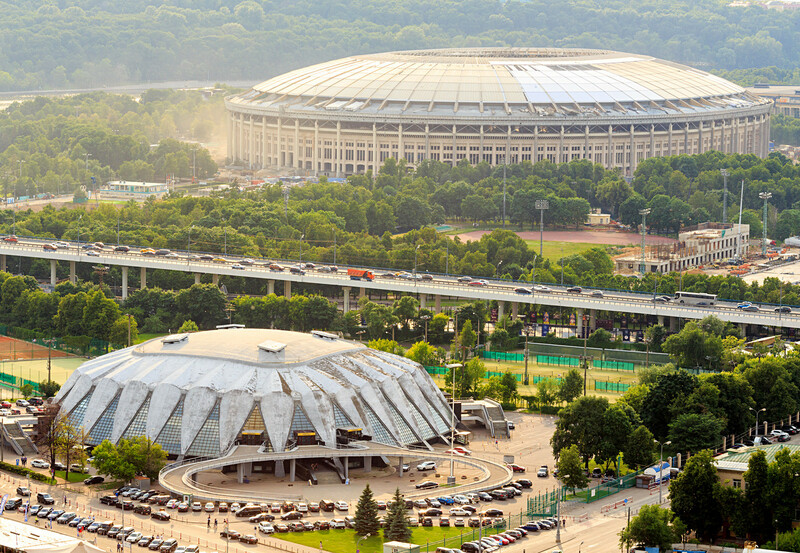 Druzhba Multipurpose Arena is part of the Luzhniki sports complex built for the 1980 Olympics. Shaped like a sea star, it is actually a replica of Rome's Olympic Palazzetto dello Sport. If you come to Moscow for the FIFA World CupTM, you’ll have a chance to enjoy this view — most perfectly observed from Luzhnetsky Bridge.